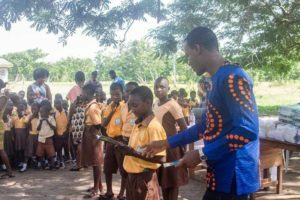 Citi FM's News anchor Umaru Sanda Amadu has donated three thousand books to schools in his home community of Shai Osudoku in the Greater Accra Region. 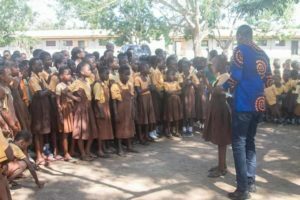 The beneficiary schools includes Asutsuare Junction, New Jerusalem and Kongo Basic Schools. The Host of Eyewitness News on Citi FM, made the donation with support of a friend and the team at GEDAid. ''I did the donation with the support of a friend and the team at GEDAid. 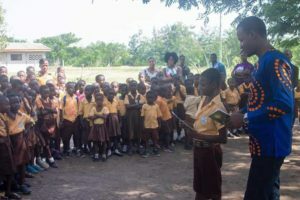 It was a beautiful thing watching some of the children read paragraphs from the story books donated and hearing them answer some of my questions.'' - he said in Facebook. ''Here is my motivation for doing this. As a child, I loved reading. I read anything (my favourite was the questions and answers under the “Robot Bubble Gum” wrappers). I used to lead my class in reading the English text books. There were times I was called to the seniors class (Class 6) to read a passage for them after which I was given the cane to whip my seniors. Fun, init?'' - according to the radio personlity. 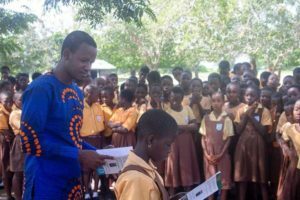 Umaru Sanda completed the Asutsuare Junction D/A Basic School in 2003, before proceeding to the Tema Secondary School on a scholarship from the District. He then proceeded to the Ghana Institute of Journalism where he obtained a Bachelor’s Degree in Communication Studies. He has been working with one of Ghana’s leading radio stations, Citi FM, since 2010. Umaru has a knack to make stories and documentaries that has won him many awards over the period. 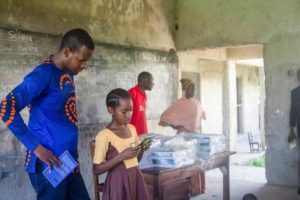 In 2014, a documentary he made on the scarcity of water and the implications for citizens, especially residents of Accra, captured the essence of the problem the situation posed to residents. This documentary led him winning the WASH award in Sweden. Umaru Sanda Amadu’s award-winning documentary, titled “Living Open Defecation,” revealed how it appears the phenomenon of open defecation in some coastal communities especially at La in Accra may not be able to succeed in the fight against open defecation due to the lack of toilet facilities in most houses in the area. In the same year, he was nominated for an award at the 17th Ghana Journalists Association Awards. Earlier that year, Ghana’s National Roads Safety Commission nominated Umaru Sanda Amadu for the Road Safety Media Awards. 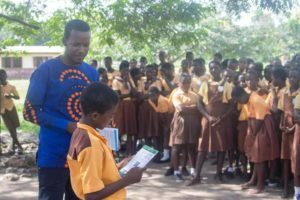 A research conducted by UNICEF revealed that 1, out of every 5 Ghanaians defecate in the open and only 1 of 6 Ghanaians have toilets in their homes. In the rural areas, only 1 out of every 10 Ghanaians have toilets in their homes. According to the documentary, authorities were losing the fight in combating the menace. Umaru Sanda Amadu is a broadcast journalist and news producer at 97.3 Citi FM. He was once the producer of the award winning Citi Breakfast Show and and host of news analysis programme, The Big Issue which happens every Saturday.